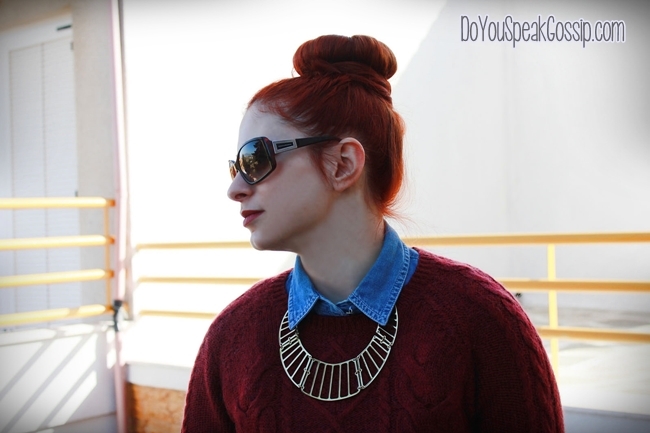 Modern Preppy | Outfit post - Do You Speak Gossip?Do You Speak Gossip? P.S. This was my first attempt on creating a high bun, using the hair donut I showed you on a previous post. Υ.Γ. Αυτή ήταν η πρώτη μου προσπάθεια να δημιουργήσω κότσο στην κορυφή του κεφαλιού, χρησιμοποιώντας το ντόνατς μαλλιών (ή αλλιώς μπομπάρι) που σας έδειξα σε αυτό το ποστ. Πολυ ωραια ολα σου τα τελευταια ποστ!!!!!! τα ειδα τωρα , ολα μαζεμενα και μου αρεσαν πολυ…και το χρωμα το μαλλιων σου νομιζω οτι ειναι πολυ πετυχημενο!! Thelei sixni ananewsi alla sigoura tha kratisw to kokkino oso perissotero mporw! You look so super chic and trendy! Just like snapped on a street style blog. Love your attention to detail – socks and one side of shirt left untucked into jeans. I’ll visit your blog as soon as possible. You can find me too on Facebook, chicisimo, and Lookbook! Τα αξεσουάρ σου είναι καταπληκτικά!!! I love your bag and sweater! burgundy rocks. CaterinaDrak recently posted..La creation. Collage. 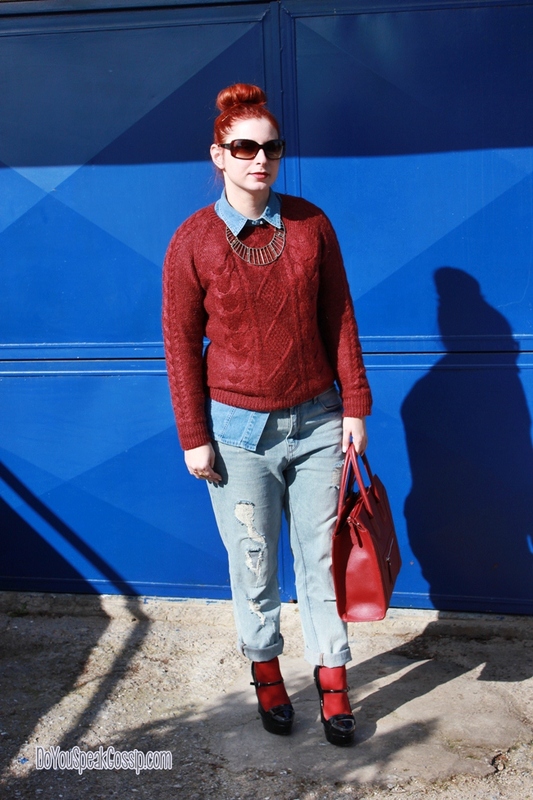 Hi darling, absolutely love this post, I love seeing your style and these pics are inspiringly fabulous! Υοur shoes rock! Ohh..I love this one!! Perfect bun! Thank you very much for your compliments Lejla. I’m very glad that you liked my blog, and that you’re coming here again! 🙂 Also thank you for the follow on FB. 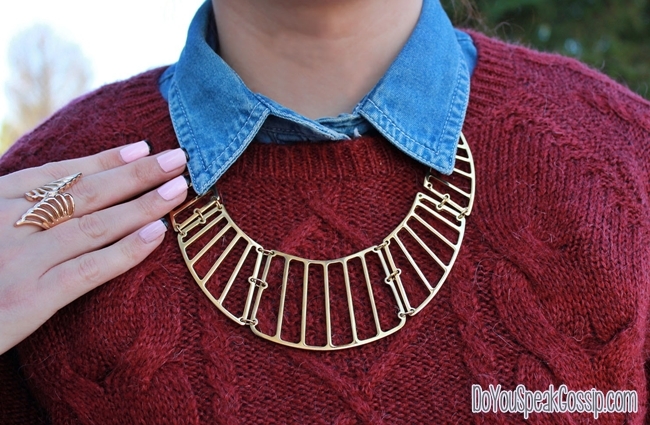 love this look and also your blog! It’s so nice!!! I follow you! Thank you very much Francesca! I didn’t see any follow, but I hope to see you again in the future. S’euxaristw para poli Elena! Idio poulover e? xixi einai poli voliko! Katalavainw giati kai mena otan itan poli makria ta mallia mou itan diskolo na piastoune panw, alla epeidi xrisimopoiisa to hair donut gia ton kotso, meinane para polles wres…eimai sigouri oti kai se sena tha menane…kai einai poli eukolo sti xrisi…isws prepei na to dokimaseis an sou aresoun autoi oi kotsoi! Όσο για το σύνολο, λατρεύω τα χρώματα και τα παπούτσια, ίσως να πρόσθετα ένα παραπάνω χρώμα για να σπάσω την διχρωμία, αλλά αυτή φυσικά είναι μια άποψη που ταιριάζει στο δικό μου στυλ! 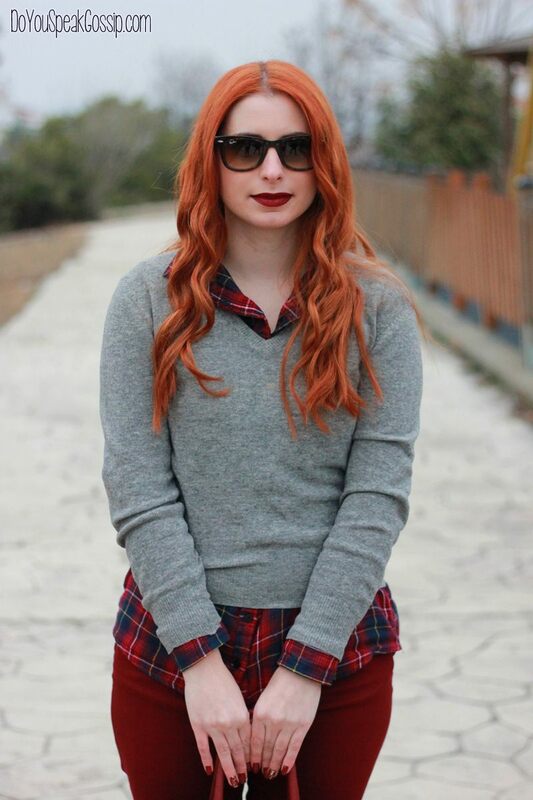 Μου αρέσει πάντως που προτείνεις και πιο casual outfits τελευταία! Gia ta teleutaia pio casual outfit, exw na euxaristisw to agori mou, pou dextike na me voithaei pio sixna me tis fwtografies, kai etsi mporw pleon na ta fwtografizw kai ayta…ta kathimerina mou sinola einai oti pio casual mporeis na fantasteis sinithws, opote ta vriskw ligo vareta gia na ta postarw edw…tha’nai san na sas deixnw ta idia kai ta idia sinexeia…. Wow love the jumper and your hair, visually the colours are so good together!! and great job with the hair bun, really suits you m! I really like graffiti walls as a background for some of my looks, and this particular one, I’ve used before in my bare midriff post I had made before leaving for London last November. I liked the hair bun too, and I’m definitely going to make it again, although it does get many stares. I’m going to freshen up my hair color again tomorrow, not exactly dye them again, but something to keep the color vivid for longer. sou paei kataplhktika to xrwma auto !!!! 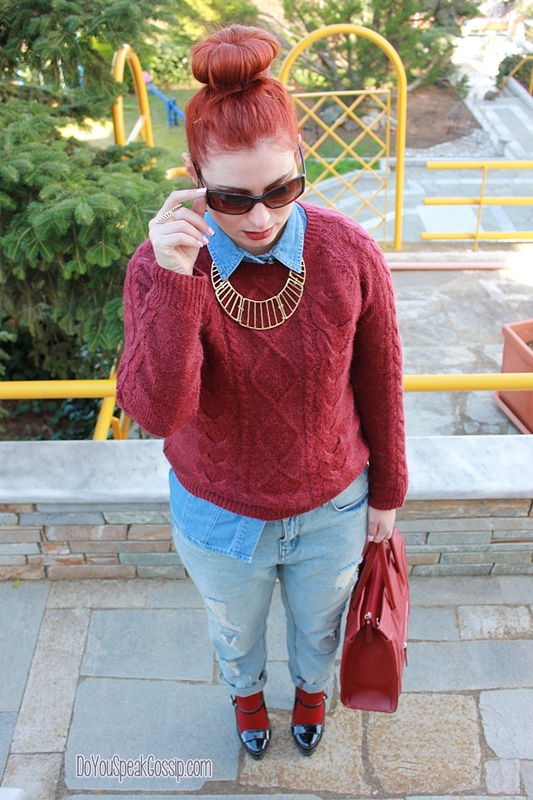 Πολύ ωραίο outfit!! Μου άρεσε ο τρόπος που συνδύασες το τζιν πουκάμισο με το πουλόβερ!! Love this outfit very much! Love the bag and how you added the undersocks! 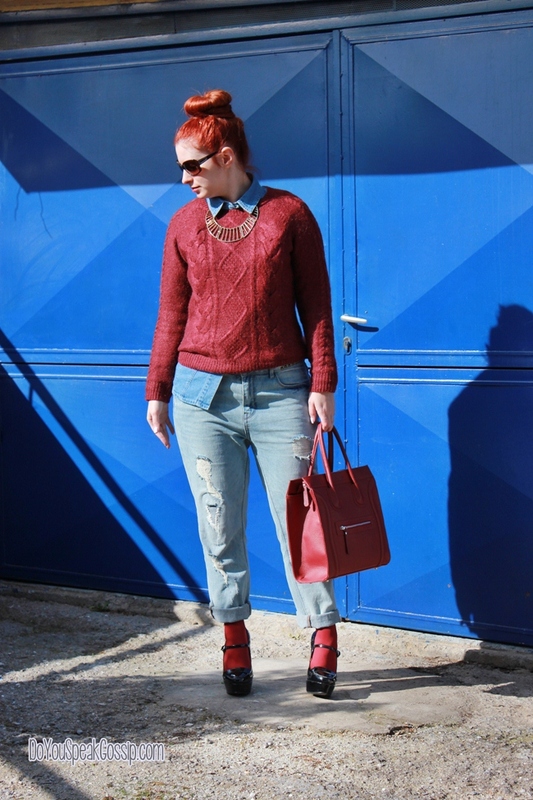 Jeans με burgundy είναι ένας υπέροχος συνδυασμός! Τα μαλλιά σου σου πάνε απίστευτα έτσι! Είσαι κούκλα! 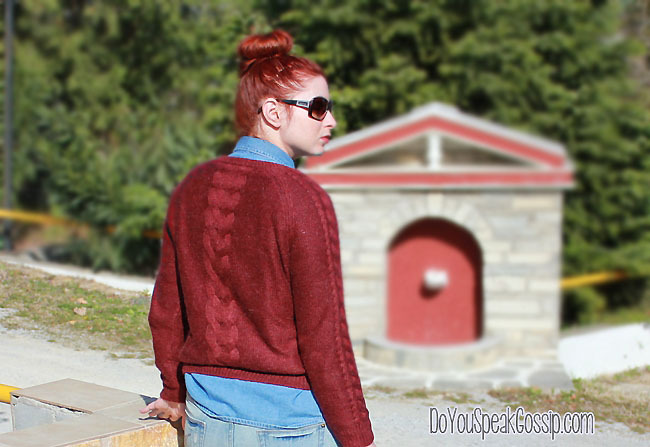 Pingback: Vintage leather & tartan | Outfits | Do You Speak Gossip?